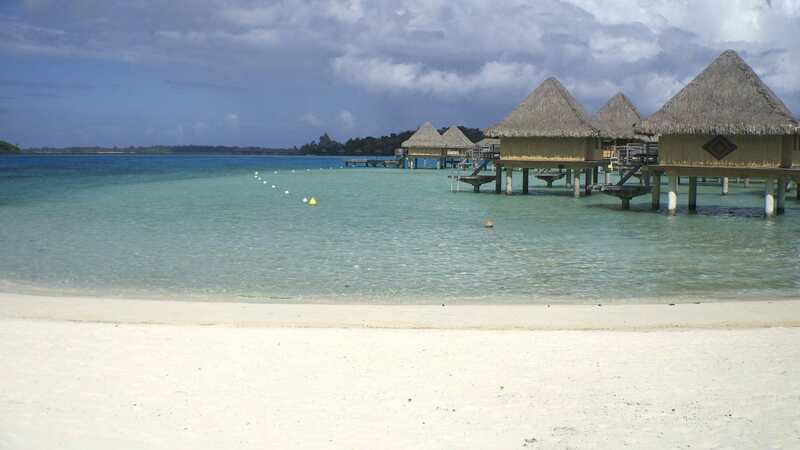 Wedding magazines, brochures and Wedding Planning sites have sold Bora Bora as “the most romantic island in the world” for years and the message has stuck. On an evening chatting with the Tourism Board I discover that 90% of the visitors are indeed on their honeymoon (I was traveling alone at the time). It is no wonder that couples are overwhelmed with the choice of resorts available. Not because Bora Bora has a never ending list of alternatives, unlike other paradisiac destinations like the Maldives, the tiny Pacific island has a maximum of ten possible luxury resorts, but because this is a once in a lifetime experience and nobody wants to make the wrong choice. Here is a handy guide to know what is best for you – when you are breaking the piggy bank, expectations are everything. Location is key on Bora Bora. The island is made of a volcanic center surrounded by a famous lagoon. Most of the high-end properties are on the lagoon, be it facing the motu, or outer reef, or on it. The four resorts on the motu are the most premium. The fantastic four are the St. Regis, Four Seasons, Intercontinental Thalasso Spa and Le Meridien and they enjoy the calmest, most beautiful waters and the best views over Mount Otemanu. Also on the lagoon, but not on the motu, are the Sofitel Private Island and the Sofitel, in front of each other but providing a very different experience. Whereas the Sofitel Private Island is on its own tiny island, still facing Otemanu, the Sofitel is on the bay, facing the Private Island and therefore with no views to speak of. It is also located on a deeper part of the lagoon, so the crystalline shallow waters that you see on postcards have taken a darker hue. As it is located on the shadow of Mount Otemanu facing East it gets much less sun than the rest of the resorts and only sees the sunrise. The reviews on TripAdvisor are very different from the rest of the resorts so I will not include it in this list as I feel it is not at the same level. Finally, farther away from everything else is the Hilton, at the other end of the lagoon and close to the entrance to the lagoon used by the cruise ships. Here’s a short list of the resorts mentioned below, read no for in-depth details. I have written a detailed review of the property here but the Thalasso differentiates itself by the shallow and warm lagoon the over water villas are located on, for the daily sting ray feeding and for the magnificent views over Mount Otemanu. It is a fantastic resort in which to relax and watch the sun set, get wet with the many complimentary water equipment and retire to the spacious over water villas. The resort offers only villas on the lagoon non of which come with a pool. Being relatively compact you feel as if you are visiting a friend in the Pacific. There is a sense of French socialism – all rooms are the same and the Concierge treats all guests equally. 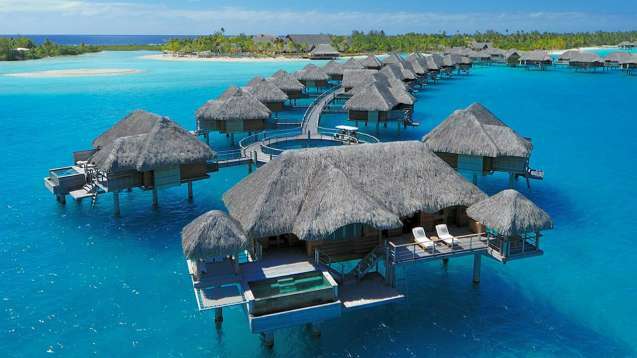 Of all the luxury resorts in Bora Bora the Thalasso is good value for money and makes the most of its lagoon location. After all, you came to Bora Bora to be in the water. Lastly, it also features the most sophisticated and over the top spa of all of them. Check out my video of the property and Bora Bora below. Unique features: The Thalasso does make an effort to be eco-friendly and has designed a cooling system that uses sea water to power the AC saving energy in such an isolated part of the world. The Deep Ocean Spa has been named the best in the Pacific. The resort’s location is the best: shallow lagoon, crystalline safe waters and boat traffic away from the beach. The daily ray feeding on the beach is a plus. Villas are spacious and with plenty of luxury details. Given the high-end character of the resort, and in comparison with the other luxury properties, the starting rates at USD900 per night with breakfast in a random week in September were decent (relatively speaking). As it is the closest to mainland it is also the fastest and easiest to access town from, handy if you plan to venture into the island for dinner. Down sides: Particularly in the low season when the fine-dining restaurant is closed, the options for food can become repetitive as most guests take lunch and dinner at the resort. Also, I found the service to leave a lot to be desired, the concierges acted as if we bothered them when we asked to book activities. This is the luxury gem of the Pacific. Think expansive grounds, two swimming pools, several restaurants including an over water fine dining venue, your own personal butler to tend to your every whim, and villas with pools. The ultimate luxury escape: the Royal Estate which must be for, ehem, Royals, because it is the size of a huge mansion including three pavilions, its own chef and a swimming pool. This is where, I can only assume, royalty comes to retire to a life of luxury and debauchery. The Estate looked way off limits for mere humans like me. Unique features: swim up bar, higher privacy in the villas than the rest, largest over water villas, some with plunge pools, inner lagoon the same depth as the Thalasso’s main lagoon, your own butler. The newly refurbished Clarins Spa could be a treat too. As it is a large resort there are also villas on the beach. Down Sides: The St. Regis is ridiculously expensive and clearly leverages the high-end status of the brand. Tasting dinner menus start at $160 can set you back a few thousand dollars for a week in paradise. A random price check for September shows rates starting at USD1,500 for room only. The larger size can also make it feel impersonal. Le Meridien is set between the St. Regis and the Thalasso on the main Lagoon. The villas are the smallest of all and don’t offer any extravagance. Like at the Thalasso, they are all the same – it seems the French socialism is most prominent here. It is possibly the best priced of all the lagoon resorts and also the oldest and least presumptuous. For the price, I would stay at the Thalasso before Le Meridien as the price gap is small and the Thalasso is much better. Without having been to Le Meridien, reading other guest’s review and taking a peek at the look and feel of the resort from the water, I had the feeling that the hotel was relatively worn down and unsophisticated with much smaller villas when compared with the other truly luxurious lagoon properties. Unique features: It is a Starwood property with a more affordable level than the St Regis in case you are using points. But it does feel like the poorer brother. The best selling feature is the fact that it is set among the Three Musketeers but with the most affordable prices. On the plus side, it does offer beach villas with their own pools, something quite rare in Bora Bora. Down Sides: Smaller overwater villas. The food may be poor value for money judging by the many negative comments on TripAdvisor. There is less of an out of the ordinary feel and, let’s face it, you come to Bora Bora for that once in a lifetime experience. If the St Regis was opulence, it competes in that category with the Four Seasons. 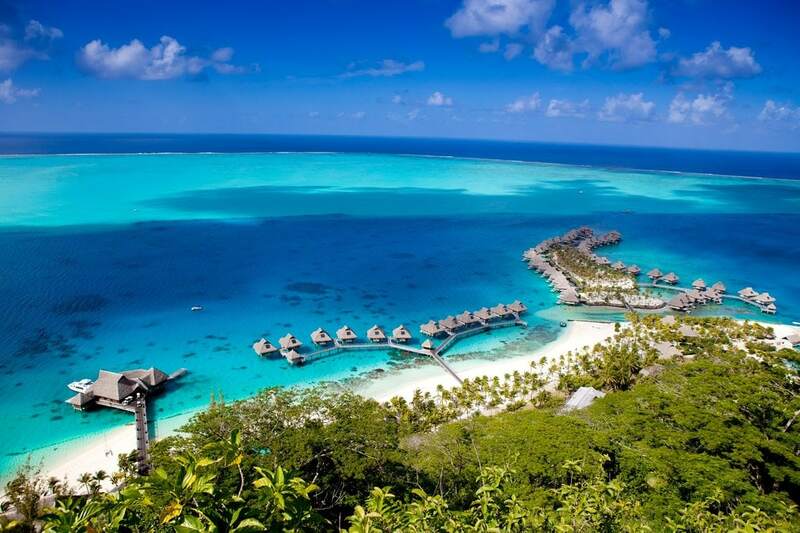 For years chosen as THE luxury option on Bora Bora it offers overwater villas with plunge pools and various beach villas with their own private pools. Unique features: The large catamaran used to fetch guests from the airport already sets the tone. You are not picked up by the speedboat from any other resort, you are picked up by the large extravagant Four Seasons Catamaran which you can also rent for all your island needs. The villas are the most beautifully appointed. 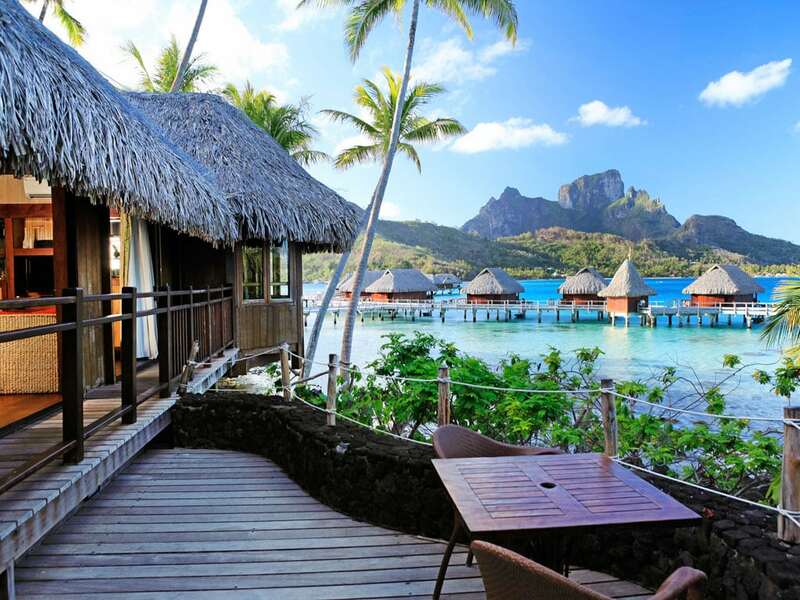 It is one of the largest resorts in Bora Bora ensuring that you get lost in paradise. Down sides: The price. Obviously, luxury doesn’t come cheap and the Four Seasons knows how to put on a show, and steal it. Even with the 5th night free, the average rate at the lowest category overwater villa still starts at no less than USD1,500. Without the offer a week’s worth at the Four Seasons would be USD10,000, room-only. Add in an equal amount for food and activities for two, easily. This is also the resort where food and activities were most unreasonably priced. One comes to expect that things will be marked up in such locations but the Four Seasons seemed to be going the extra mile. As it is the farthest from mainland (30-45min by boat) it is unlikely you will venture into town for dinner. The resort’s charge for the boat trip will further dissuade you. Come and stay in. This is the only hotel in this list that is not on the Motu or lagoon area and sadly, this is the downside. Although the waters are still beautiful and the Conrad is closest to the stingray and shark swimming spot, it faces the open sea so it does not enjoy the same beautiful views from the rest of the resorts, or the quieter crystalline waters of the shallow lagoon. That being said, it is still a beautiful resort that has recently been refurbished so expect an amazingly new experience. Unique features: They have some of the most, if not THE most, impressive villa at the end of the pontoon featuring two stories and a pool. Down sides: Location – Location – Location. You come to Bora Bora for the location and the Conrad is the only one, of the highest luxury properties, not on the lagoon. And if you thought about spending he days at the lagoon or on mainland, forget about it. The resort charges a hefty fee to take you to town so you are essentially stranded. A relatively compact resort set on a small island across the water from the Intercontinental Le Moana and facing Otemanu. Sofitel Private Island sounds idyllic, and it sure is, but the advantages of such a small luxurious resort and its privileged location on a private island may have too many downsides in real life. A priori, a smaller size is a cozier and more exclusive set-up. However, the very few villas on stilts are very near each other and very compact. There is little in the way of privacy and, given it is on the way to the main island for all boats, the traffic that cruises past the overwater villas every day must be something of an annoyance to the high-paying guests. Given the small size of the island there is practically no beach to speak of so you will have to while away the days on the relatively deep lagoon that has turned a darker shade of turquoise rather than the powder white blue of the shallower areas. Unique features: You can boast about spending time on a private island in Bora Bora and none of your friends will be able to tell any downsides from this exclusive location. 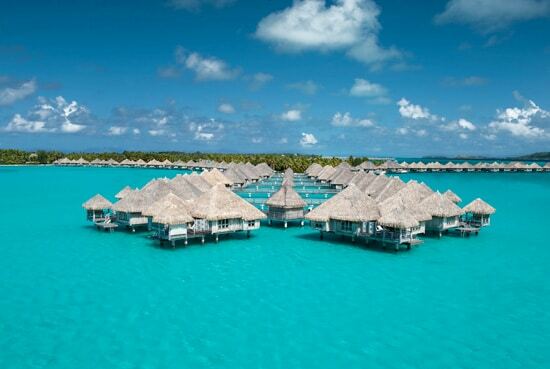 It’s also the only kids-free resort in Bora Bora. The viewing platform at the top of the hill offers beautiful 360 degree views and the opportunity for that romantic dinner during which to pop the question. As it is facing Otemanu from the closest angle the mountain can be seen right in front of you but the angle is just not as magnificent as from the resorts on the motu. The island is right next to the Coral Gardens where all tours take guests to snorkel so you can access it more easily. Mainland is just a stone’s thrown. Down sides: It may feel a bit claustrophobic to constantly bump into other guests and to spend most of the day in the villa, which has little privacy. On my way to the on-shore excursion I passed by the resort several times on the speedboat and, each time, I could perfectly see the guests of the Sofitel relaxing on their decks. The resort has access to the facilities of the Sofitel across the water but beware of the downsides of this hotel too. For the price, I would rather stay anywhere else but this resort. Less flash and pretentious than the rest Le Moana is an ode to Polynesian architecture and laisse-faire. The 4-star resort is on the main island making it easy to travel into town and it offers both beach as well as overwater bungalows. They are both relatively compact with well-appointed, built-in local bamboo materials. You do feel like you are in your own paradise hut rather than in the room of an expensive hotel. The swimming pool merges into the ocean and the lagoon, at that side of the island, is as crystal clear as by the motu. The locals live alongside the beach sharing the space with hotel guests. Unique features: Easy access to mainland for evening meals and entertainment away from the resort, you can actually walk out of the hotel’s main entrance and into one of the world’s most beautiful beaches in two minutes. The location, away from the main traffic, also means quieter times. The beach bungalows are a great way to get your own slice of beach in front of your hut. They are spacious and provide almost full privacy. As it is also one of the oldest resorts on the island it is also one of the most affordable and authentic. I found Le Moana to be friendly, characterful and unassuming and great value for money. As it is part of the Intercontinental group, you can visit the Big Brother Thalasso for lunch or dinner and also book at the Spa but the boat transfers are not that frequent so you may end up wasting quite a fair bit of the day doing this. Down sides: If you are looking for modern and advanced room features or for your own butler this is not the place. The AC was relatively noisy and the room slightly dated but it gave it all the more character. 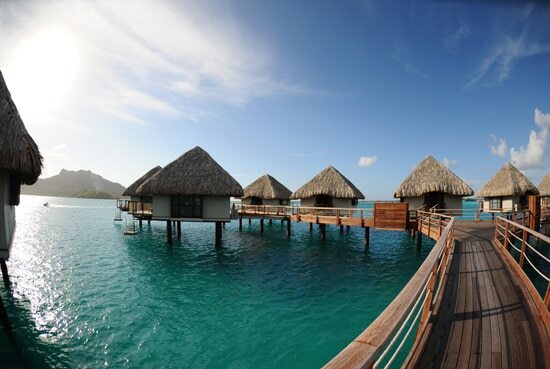 The overwater bungalows offer little in the way of outdoor space or privacy, but this is a general issue in Bora Bora. Food can be really repetitive as there is only one Polynesian restaurant, but being on the mainland, you are better of wandering into town to the many options available. Have you been to Bora Bora and have a different view on my recommendations? Did you stay at any of the properties?